Do You Remember... "Whispering Smith"
Nothing went right from the get-go with Audie Murphy’s “Whispering Smith”. 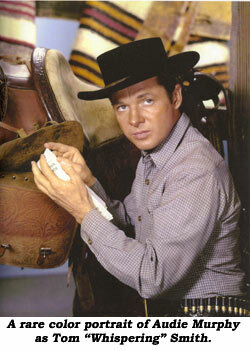 Murphy, hoping to transfer his western screen image onto the small screen, went into production for Revue with “Whispering Smith” (loosely based on the Alan Ladd film) in the summer of ‘59 on the Universal backlot. The first episode didn’t air until two years later! Calling it “Dragnet on horseback”, Murphy told TV GUIDE (7/29/61), “When they said this series could be made cheap my immediate reaction was that we wouldn’t make it cheap at all. I fought with them constantly”, over scripts, budgets, directors, etc. There were headaches on “Whispering Smith” at every turn. Four different producers worked on the show. Costs (initially $45,000 per episode) soared. Even Audie’s horse, Joe Queen, was a problem—he was so fast he outran all the other mounts. Finally, Audie was forced to use a double horse. 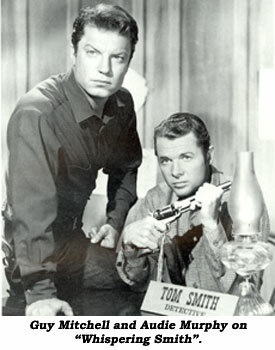 Problem-plagued, the show hit another snag after filming seven episodes when co-star Guy Mitchell (as Audie’s partner George Romack) broke his shoulder in a horsefall, halting production for six weeks. Then, actor Sam Buffington, who played Chief John Richards, Audie’s superior in the series, committed suicide. “I guess he must have seen the rushes,” Audie sarcastically remarked. NBC replaced “Whispering Smith” on the scheduled lineup with “Richard Diamond, Private Detective”. Murphy, meanwhile, fulfilled a feature film commitment and, eventually, a total of 26 episodes were filmed. The series, about the exploits of 1870’s Denver police detective Tom ‘Whispering’ Smith, finally began airing (when an ill fated “Acapulco” was scrapped) on Monday, May 8, 1961. (“The Blind Gun” w/Jan Merlin.) “It’s like the Redstone rocket—obsolete, but they’re going to fire it anyway,” Audie joked. Less than 20 episodes aired (5/8/61–9/18/61) before the show was canceled due to its violent content and low ratings and replaced by “87th Precinct”. The violence NBC and the Senate Subcommittee worried about in ‘61 pales 38 years later by today’s savage, profane standards. We’d all be better off with Audie’s morals back on TV.